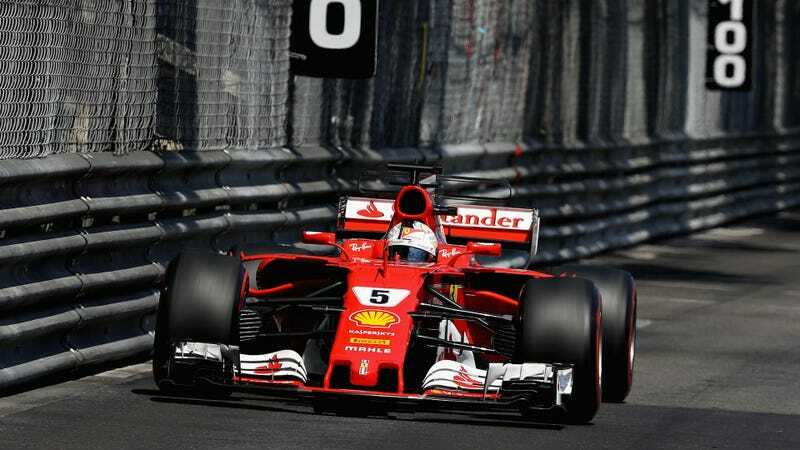 Though he sat on pole position for the first time in nine years at the Monaco Grand Prix and looked about as thrilled as Kimi Raikkonen can, it was his Ferrari teammate Sebastian Vettel who got the big win Sunday. A less dominant force than usual, Lewis Hamilton finished seventh after a disastrous qualifying run. It’s the first Scuderia Ferrari win in Monaco since 2001, which, in case you’re still stuck in 2007, was somehow 16 years ago. The Ferrari team doubled up on the excitement, with Raikkonen coming in second ahead of Red Bull’s Daniel Ricciardo and Mercedes’ Valtteri Bottas. The all-Ferrari front row and top-two finish put the team well into the top spot in the constructors’ championship, with 196 points to Mercedes’ 179. The other teams are in the double digits, for comparison. McLaren-Honda, with two DNFs recorded in Monaco, still has a whopping zero championship pointsbetween its two cars. Good thing McLaren driver Fernando Alonso ducked out for this one. Things were decently calm at Monaco during the middle portions of the race, but a safety-car period for Pascal Wehrlein flipping into a wall on lap 61 of the 78-lap race looked like it would shake things up. It didn’t do much at the top of the board, since Monaco is a bit of a conga line with few places to pass and plenty of places to hit the wall. Hamilton made up enough ground to get seventh, but the end result was so unlike him that the points standings are getting ugly: Points leader Vettel could skip the next race and runner-up Hamilton could win it, and that would allow nothing more than for Hamilton to catch him in the points. Regardless of the stretched-out championship picture, it was a decent race. And to think, we’ve still got the Indianapolis 500 in a few hours.